AM I REALLY JUST NUTS? When a friend sent me this cartoon, it brought me a hearty giggle at first glance. How often have we all heard the expression “You are what you eat” and not given serious thought to it? 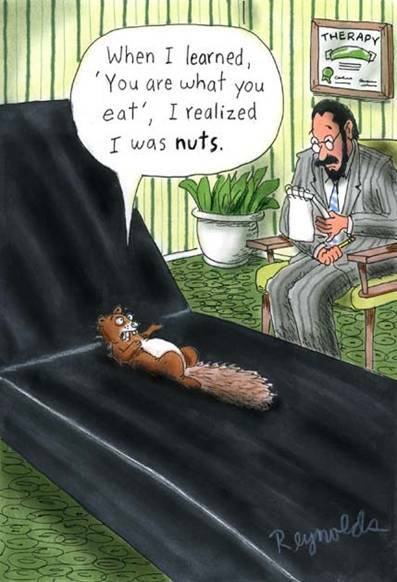 Being the Nut Gourmet, I felt compelled to share the giggles. This cartoon is just too cute to simply sit on my desktop unseen and unappreciated by those who would find it as deliciously compelling as I have. I contacted the cartoonist, Dan Reynolds, and received permission to reprint it here on the NutGourmet Blog. This clever cartoonist has created several other cartoons with a nut theme that may be available by contacting him at dan@reynoldsunwrapped.com. Dan says anyone can receive his daily email cartoon for a whole year for $10. Not a bad deal for a year of daily laughs.